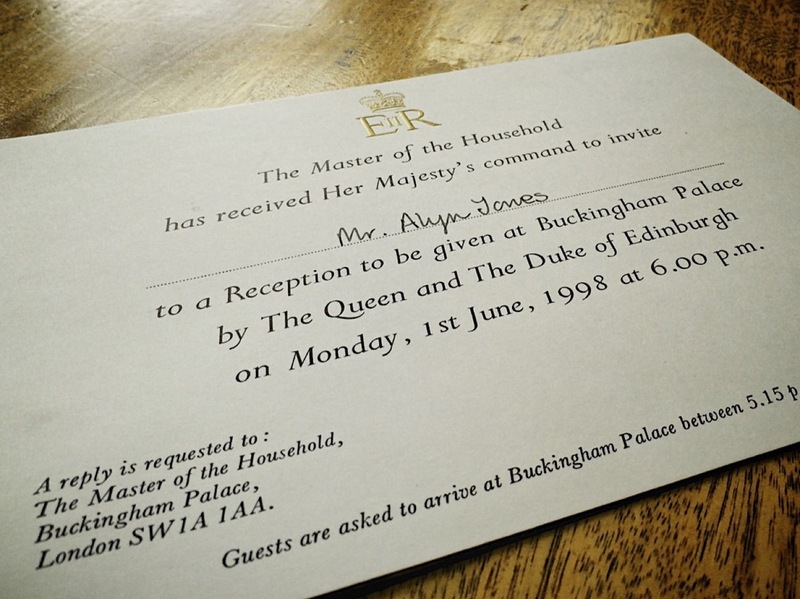 NBD: Just The Time I Got Invited to Buckingham Palace by The Queen — ALYN & A.J. One afternoon, I was at home studying in my apartment when there was a knock at the door. When I opened the door, the mailman was standing there. Surprised that there was no package in his hands, I wondered what he wanted. He gave me a hand written envelope with a smile. 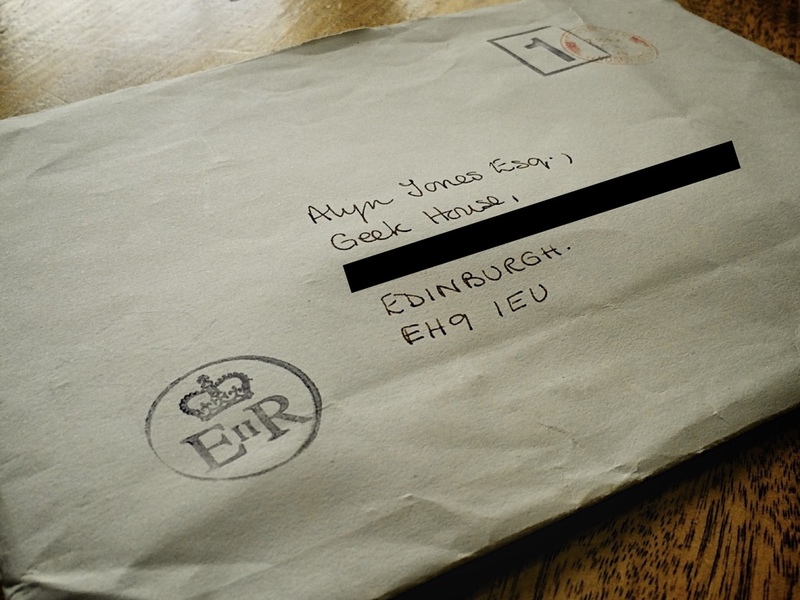 Even after all these years, it still makes me chuckle that someone at Buckingham Palace had to address mail to "Geek House" the name I gave to the apartment I lived at. Note the Royal cypher: the ER stands for Elizabeth Regina (latin for Queen) - thus Queen Elizabeth the 2nd. Noticing the Royal cypher on the envelope, I wondered what the letter was about. The handwriting on the front of the envelope could have been my mother's so I was wondering if this was a joke. When I turned the envelope over to open it, I saw the Royal warrant. Intrigued, I opened it. You can see the Royal cypher at the top embossed in gold. The edges of this card are also in gold, but I couldn't get a good photo to illustrate it. Note the custom font used but terrible kerning (e.g. the "r" and the "g" of Edinburgh). Pretty insane right? 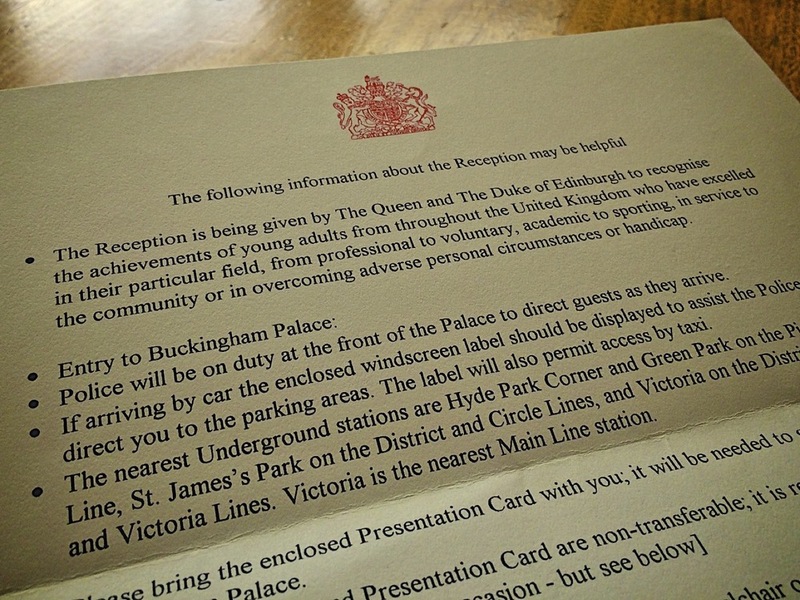 At this point, I am not quite sure why I'm being invited to Buckingham Palace but that didn't matter. I was still in a bit of shock. I was thinking, "If this is a joke, this is a really elaborate joke." I looked back in the envelope and found a letter which provided a little more information. 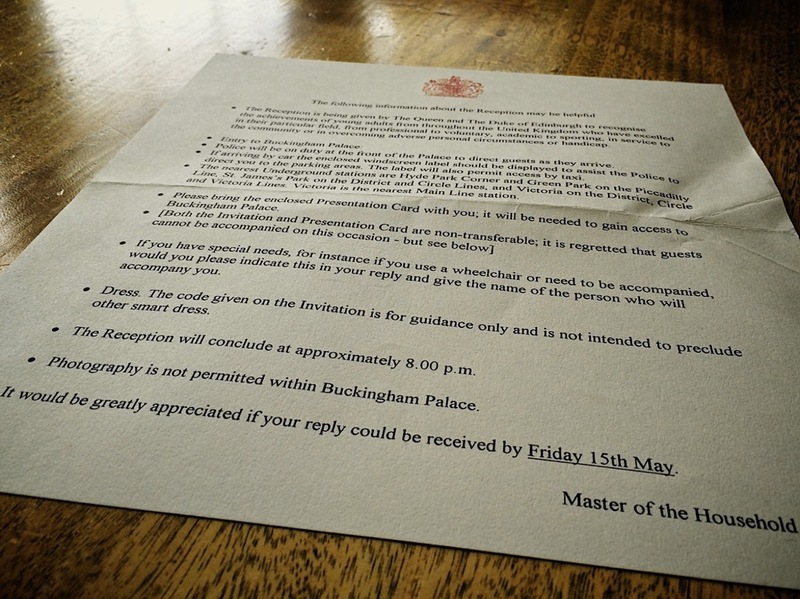 Though the letter claimed the reception was for "young adults...who have excelled in their particular field" I was struggling to come up with a reason as to why I was invited (a feeling I revisited on the actual day when in the company of Olympians, pop stars, actors, servicemen and women and academics). Which particular area of excellence was I being recognized for? Eating cereal? Playing video games? Bad haircuts? As I read on, there was lots of details: dress code suggestions, time the event finished, don't bring anyone, RSVP details and no photography allowed (so Instagramming the event was out, well that and Instagram wouldn't be invented for another twelve years). After digesting it all, I did what any Scottish lad would do. I called my mother. She - rather expectedly - squealed with delight at the notion of her son going to visit the Queen. She was less excited when I told her I couldn't bring her unless I went in a wheel chair. I'm pretty sure she contemplated the ethics of that for at least half a second and then reverted back to squealing with joy. Up until the day I arrived I wasn't quite sure how I got on that list. Upon arriving at Buckingham Palace I was given a little booklet that included the guest list and a floor plan of Buckingham Palace (should I fancy a wander). Next to my name was the phrase "Princess Alice Scholarship Winner". I wasn't quite sure who Princess Alice was but I do remember applying for a grant the year before to fly to California to conduct some research for my final year thesis. I was awarded the grant and thought nothing more of it after booking my tickets to head to Silicon Valley to hobnob at Apple, IBM, Yahoo! and Netscape (Netscape!!!!). So yes, the sum total of my excellence was swanning off to sunny California for a couple of weeks. I kept that quiet while standing next to the guy who was blinded while saving someone from an attack. It turns out Princess Alice was the Queen's mother-in-law. She died in 1969 so was unaware of my California visiting excellence. Photo courtesy Jimmy Harris, used under license. © Jimmy Harris. Modified for use. The event itself was impressive. How could it not be? I was in a PALACE with a real life QUEEN. Take a look at some of the rooms we were in. It was quite the thrill to pass through the big gates above into the courtyard and then into the palace. There was a string quartet playing to greet us and then we were given pretty much free access around the state apartments. There was food and drink served (by real life servants!) and members of the Royal Family wandered around greeting people. Two things stand out to me from my visit. First: the bathrooms were hidden in the walls of the corridors. A servant asked if he could be of assistance and I replied that I needed to visit the lavatory (proper English like). He proceeded to say, "This way sir," and pushed a section of the wall to reveal a hidden door. (There's another cool story regarding the bathrooms, but only guys would understand why it's cool). The second thing was my slight faux pas. At one point I stepped onto the balcony overlooking the gardens. Taking in the fact that I was a) at Buckingham Palace and b) overlooking their marvelous gardens I spotted something on the lawns below. I exclaimed (to no one in particular), "Oh look! They have rabbits!" at which point one of the staff leaned forward and said, "Actually sir, they are pheasants." Of course. Why would the Queen keep rabbits? Thanks to the ease of digital storage and my general laziness in tidying up old hard drives, I found my reply to the invitation. Thankfully my mother knew the exact protocol in replying to letters from the Queen. It's a shame she never taught me the difference between a rabbit and a pheasant.